Plumage refers both to the layer of feathers that cover a bird and the pattern, colour, and arrangement of those feathers. The pattern and colours of plumage differ between species and subspecies and may vary with age classes. Within species, there can be different colour morphs. The placement of feathers on a bird is not haphazard, but rather emerge in organized, overlapping rows and groups, and these feather tracts are known by standardized names. Fur is a thick growth of hair that covers the skin of many animals. It is a defining characteristic of mammals. It consists of a combination of oily guard hair on top and thick underfur beneath. The guard hair keeps moisture and the underfur acts as an insulating blanket that keeps the animal warm. Buoyancy or upthrust, is an upward force exerted by a fluid that opposes the weight of an immersed object. In a column of fluid, pressure increases with depth as a result of the weight of the overlying fluid. Thus the pressure at the bottom of a column of fluid is greater than at the top of the column. Similarly, the pressure at the bottom of an object submerged in a fluid is greater than at the top of the object. The pressure difference results in a net upward force on the object. The magnitude of the force is proportional to the pressure difference, and is equivalent to the weight of the fluid that would otherwise occupy the volume of the object, i.e. the displaced fluid. Crude oil and refined fuel spills from tanker ship accidents have damaged vulnerable ecosystems in Alaska, the Gulf of Mexico, the Galapagos Islands, France, the Sundarbans, Ogoniland, and many other places. The quantity of oil spilled during accidents has ranged from a few hundred tons to several hundred thousand tons (e.g., Deepwater Horizon Oil Spill, Atlantic Empress , Amoco Cadiz ),  but volume is a limited measure of damage or impact. Smaller spills have already proven to have a great impact on ecosystems, such as the Exxon Valdez oil spill because of the remoteness of the site or the difficulty of an emergency environmental response. A tanker is a ship designed to transport or store liquids or gases in bulk. Major types of tankship include the oil tanker, the chemical tanker, and gas carrier. Tankers also carry commodities such as vegetable oils, molasses and wine. In the United States Navy and Military Sealift Command, a tanker used to refuel other ships is called an oiler but many other navies use the terms tanker and replenishment tanker. Hurricane Ivan was a large, long-lived, Cape Verde hurricane that caused widespread damage in the Caribbean and United States. The cyclone was the ninth named storm, the sixth hurricane and the fourth major hurricane of the active 2004 Atlantic hurricane season. Ivan formed in early September, and reached Category 5 strength on the Saffir-Simpson Hurricane Scale. Ivan caused catastrophic damage to Grenada as a strong Category 3 storm, heavy damage to Jamaica as a strong Category 4 storm and then Grand Cayman, Cayman Islands and the western tip of Cuba as a Category 5 storm. After peaking in strength, the hurricane moved north-northwest across the Gulf of Mexico to strike Pensacola/Milton, Florida and Alabama as a strong Category 3 storm, causing significant damage. Ivan dropped heavy rains on the Southeastern United States as it progressed northeast and east through the eastern United States, becoming an extratropical cyclone. The remnant low from the storm moved into the western subtropical Atlantic and regenerated into a tropical cyclone, which then moved across Florida and the Gulf of Mexico into Louisiana and Texas, causing minimal damage. Ivan caused an estimated $26.1 billion along its path, of which $20.5 billion occurred in the United States. ↑ Estimates for the amount of oil burned in the Kuwaiti Oil Fires range from 500,000,000 barrels (79,000,000 m3) to nearly 2,000,000,000 barrels (320,000,000 m3). Between 605 and 732 wells were set ablaze, while many others were severely damaged and gushed uncontrolled for several months. It took over ten months to bring all of the wells under control. The fires alone were estimated to consume approximately 6,000,000 barrels (950,000 m3) of oil per day at their peak. ↑ Estimates for the Gulf War oil spill range from 4,000,000 to 11,000,000 barrels (1,700,000 m3). The figure of 6,000,000 to 8,000,000 barrels (1,300,000 m3) is the range adopted by the U.S. Environmental Protection Agency and the United Nations in the immediate aftermath of the war, 1991–1993, and is still current, as cited by NOAA and The New York Times in 2010. This amount only includes oil discharged directly into the Persian Gulf by the retreating Iraqi forces from January 19 to 28, 1991. However, according to the U.N. report, oil from other sources not included in the official estimates continued to pour into the Persian Gulf through June, 1991. The amount of this oil was estimated to be at least several hundred thousand barrels, and may have factored into the estimates above 8,000,000 barrels (1,300,000 m3). In general, spilled oil can affect animals and plants in two ways: dirесt from the oil and from the response or cleanup process. There is no clear relationship between the amount of oil in the aquatic environment and the likely impact on biodiversity. A smaller spill at the wrong time/wrong season and in a sensitive environment may prove much more harmful than a larger spill at another time of the year in another or even the same environment. Oil penetrates into the structure of the plumage of birds and the fur of mammals, reducing their insulating ability, and making them more vulnerable to temperature fluctuations and much less buoyant in the water. A VLCC tanker can carry 2 million barrels (320,000 m3) of crude oil. 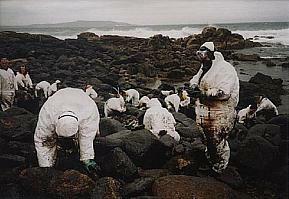 This is about eight times the amount spilled in the widely known Exxon Valdez oil spill. In this spill, the ship ran aground and dumped 260,000 barrels (41,000 m3) of oil into the ocean in March 1989. Despite efforts of scientists, managers, and volunteers over 400,000 seabirds, about 1,000 sea otters, and immense numbers of fish were killed. Considering the volume of oil carried by sea, however, tanker owners' organisations often argue that the industry's safety record is excellent, with only a tiny fraction of a percentage of oil cargoes carried ever being spilled. The International Association of Independent Tanker Owners has observed that "accidental oil spills this decade have been at record low levels—one third of the previous decade and one tenth of the 1970s—at a time when oil transported has more than doubled since the mid 1980s." Solidifying: Solidifiers are composed of tiny, floating, dry ice pellets,    and hydrophobic polymers that both adsorb and absorb. They clean up oil spills by changing the physical state of spilled oil from liquid to a solid, semi-solid or a rubber-like material that floats on water. Solidifiers are insoluble in water, therefore the removal of the solidified oil is easy and the oil will not leach out. Solidifiers have been proven to be relatively non-toxic to aquatic and wild life and have been proven to suppress harmful vapors commonly associated with hydrocarbons such as benzene, xylene and naphtha. The reaction time for solidification of oil is controlled by the surface area or size of the polymer or dry pellets as well as the viscosity and thickness of the oil layer. Some solidifier product manufactures claim the solidified oil can be thawed and used if frozen with dry ice or disposed of in landfills, recycled as an additive in asphalt or rubber products, or burned as a low ash fuel. A solidifier called C.I.Agent (manufactured by C.I.Agent Solutions of Louisville, Kentucky) is being used by BP in granular form, as well as in Marine and Sheen Booms at Dauphin Island and Fort Morgan, Alabama, to aid in the Deepwater Horizon oil spill cleanup. Shoreline type is classified by rank depending on how easy the target site would be to clean up, how long the oil would persist, and how sensitive the shoreline is. The floating oil slicks put the shoreline at particular risk when they eventually come ashore, covering the substrate with oil. The differing substrates between shoreline types vary in their response to oiling, and influence the type of cleanup that will be required to effectively decontaminate the shoreline. In 1995, the US National Oceanic and Atmospheric Administration extended ESI maps to lakes, rivers, and estuary shoreline types. The exposure the shoreline has to wave energy and tides, substrate type, and slope of the shoreline are also taken into account—in addition to biological productivity and sensitivity. The productivity of the shoreline habitat is also taken into account when determining ESI ranking. Mangroves and marshes tend to have higher ESI rankings due to the potentially long-lasting and damaging effects of both the oil contamination and cleanup actions. Impermeable and exposed surfaces with high wave action are ranked lower due to the reflecting waves keeping oil from coming onshore, and the speed at which natural processes will remove the oil. Human use resources are divided into four major classifications; archaeological importance or cultural resource site, high-use recreational areas or shoreline access points, important protected management areas, or resource origins. Some examples include airports, diving sites, popular beach sites, marinas, natural reserves or marine sanctuaries. Wikimedia Commons has media related to Oil spill . 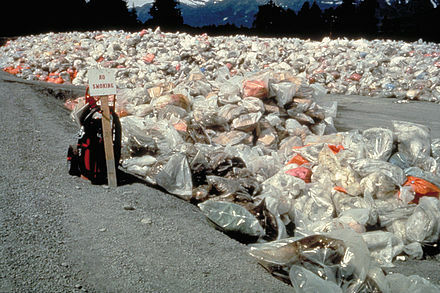 The Exxon Valdez oil spill occurred in Prince William Sound, Alaska, March 24, 1989, when Exxon Valdez, an oil tanker owned by Exxon Shipping Company, bound for Long Beach, California, struck Prince William Sound's Bligh Reef, 1.5 mi (2.4 km) west of Tatitlek, Alaska, at 12:04 am. local time and spilled 10.8 million US gallons (260,000 bbl) of crude oil over the next few days. It is considered to be one of the worst human-caused environmental disasters. The Valdez spill is the second largest in US waters, after the 2010 Deepwater Horizon oil spill, in terms of volume released. 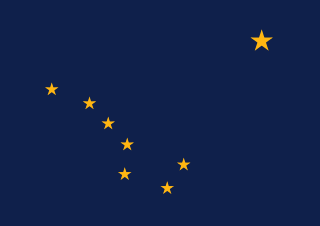 Prince William Sound's remote location, accessible only by helicopter, plane, or boat, made government and industry response efforts difficult and severely taxed existing response plans. The region is a habitat for salmon, sea otters, seals and seabirds. The oil, originally extracted at the Prudhoe Bay Oil Field, eventually impacted 1,300 miles (2,100 km) of coastline, of which 200 miles (320 km) were heavily or moderately oiled with an obvious impact. The Gulf War oil spill was one of the largest oil spills in history, resulting from the Gulf War in 1991. The apparent strategic goal was to foil a potential landing by US Marines. It also made commandeering oil reserves dangerous for US forces as visibility and movement were inhibited. The immediate reports from Baghdad said that American air strikes had caused a discharge of oil from two tankers. Coalition forces determined the main source of oil to be the Sea Island terminal in Kuwait. On January 26, three US F-117 fighter-bombers destroyed pipelines to prevent further spillage into the Persian Gulf. Several other sources of oil were found to be active: tankers and a damaged Kuwaiti oil refinery near Mina Al Ahmadi, tankers near Bubiyan Island, and Iraq's Mina Al Bakr terminal. A dispersant or a dispersing agent or a plasticizer or a superplasticizer is either a non-surface active polymer or a surface-active substance added to a suspension, usually a colloid, to improve the separation of particles and to prevent settling or clumping. Dispersants consist normally of one or more surfactants. The Automated Data Inquiry for Oil Spills (ADIOS2) software is an oil weathering model provided by NOAA that incorporates a database containing more than a thousand crude oils and refined products, and provides quick estimates of the expected characteristics and behavior of oil spilled into the marine environment. The predictions it makes, presented as both graphics and text, are designed to help answer questions that typically arise during spill response and cleanup. C.I.Agent Solutions is a Louisville, Kentucky-based company that specializes in environmental protection solutions. The company develops products to clean up hydrocarbon spills on land and water. Their main product is called C.I.Agent, a proprietary blend of USDA food-grade polymers that solidifies hydrocarbons. An oil dispersant is a mixture of emulsifiers and solvents that helps break oil into small droplets following an oil spill. 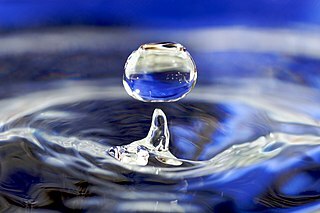 Small droplets are easier to disperse throughout a water volume, and small droplets may be more readily biodegraded by microbes in the water. Dispersant use involves a trade-off between exposing coastal life to surface oil and exposing aquatic life to dispersed oil. While submerging the oil with dispersant may lessen exposure to marine life on the surface, it increases exposure for animals dwelling underwater, who may be harmed by toxicity of both dispersed oil and dispersant. Although dispersant reduces the amount of oil that lands ashore, it may allow faster, deeper penetration of oil into coastal terrain, where it is not easily biodegraded. Petroleum microbiology is a branch of microbiology that deals with the study of microorganisms that can metabolize or alter crude or refined petroleum products. These microorganisms, also called hydrocarbonoclastic microorganisms, can degrade hydrocarbons and, include a wide distribution of bacteria, methanogenic archaea, and some fungi. Not all hydrocarbonoclasic microbes depend on hydrocarbons to survive, but instead may use petroleum products as alternative carbon and energy sources. 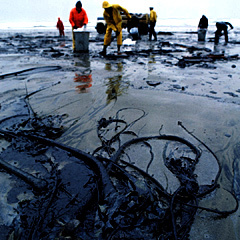 Interest in this field is growing due to the increasing role of bioremediation in oil spill cleanup. The MT Castillo de Bellver oil spill began on 6 August 1983, when the Spanish tanker caught fire off Saldanha Bay, approximately 70 miles northwest of Cape Town, South Africa. It was carrying 250,000 tonnes of light crude oil, and was traveling through an environmentally sensitive area known for its seabird rookeries and important commercial fishing grounds. The burning vessel was abandoned and broke apart after drifting offshore. The stern capsized and sunk and the bow was sunk using explosives. A total of 145,000-170,000 tonnes of oil entered the sea. Onshore impacts were considered negligible as the slick traveled seaward. The only visible impact was the oiling of 1,500 gannets that were on a nearby island. Oil pollution toxicity to marine fish has been observed from oil spills such as the Exxon Valdez disaster, and from nonpoint sources, such as surface runoff, which is the largest source of oil pollution in marine waters. 1 2 "Lingering Lessons of the Exxon Valdez Oil Spill". Commondreams.org. 2004-03-22. Archived from the original on June 13, 2010. Retrieved 2012-08-27. ↑ Wout Broekema (April 2015). "Crisis-induced learning and issue politicization in the EU". Public Administration. 94 (2): 381–398. doi:10.1111/padm.12170. ↑ CNN.com, Kuwait still recovering from Gulf War fires, 3 Jan. 2003. 1 2 United Nations, Updated Scientific Report on the Environmental Effects of the Conflict between Iraq and Kuwait, 8 Mar. 1993. ↑ National Aeronautics and Space Administration, Goddard Space Flight Center News, 1991 Kuwait Oil Fires, 21 Mar. 2003. ↑ Harvey, Steve (2010-06-13). "California's legendary oil spill". Los Angeles Times. Retrieved 2010-07-14. ↑ Gulf Oil Spill Is Bad, but How Bad?, last updated 20 May 2010. ↑ National Oceanic and Atmospheric Administration, Office of Response and Restoration, Emergency Response Division, Incident News: Arabian Gulf Spills Archived 2010-08-04 at the Wayback Machine , updated 18 May 2010. ↑ Campbell Robertson /Clifford Krauss (2 August 2010). 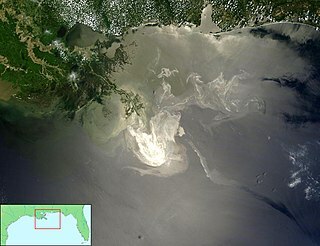 "Gulf Spill Is the Largest of Its Kind, Scientists Say". The New York Times. New York Times. Retrieved 2 August 2010. ↑ "Big Oil Plans Rapid Response to Future Spills". Abcnews.go.com. Retrieved 2012-08-27. ↑ Khatchadourian, Raffi (March 14, 2011). "The Gulf War". The New Yorker . ↑ "IXTOC I". National Oceanic and Atmospheric Administration. Archived from the original on 2012-04-12. Retrieved 2008-11-03. ↑ Fiest, David L.; Boehm, Paul D.; Rigler, Mark W.; Patton, John S. (March 1981). "Ixtoc 1 oil spill: flaking of surface mousse in the Gulf of Mexico". Nature. 290 (5803): 235–238. doi:10.1038/290235a0. ↑ John S. Patton; Mark W. Rigler; Paul D. Boehm; David L. Fiest (1981-03-19). "Ixtoc 1 oil spill: flaking of surface mousse in the Gulf of Mexico". NPG (Nature Publishing Group). 290 (5803): 235–238. doi:10.1038/290235a0. 1 2 3 4 5 6 7 "Major Oil Spills". International Tanker Owners Pollution Federation. Archived from the original on September 28, 2007. Retrieved 2008-11-02. ↑ "Atlantic Empress". Centre de Documentation de Recherche et d'Expérimentations. Archived from the original on October 19, 2007. Retrieved 2008-11-10. ↑ "Tanker Incidents". Archived from the original on June 23, 2009. Retrieved 2009-07-19. 1 2 3 "Oil Spill History". The Mariner Group. Archived from the original on 2012-07-28. Retrieved 2008-11-02. ↑ "Oil Spills and Disasters" . Retrieved 2008-11-16. ↑ "Amoco Cadiz". National Oceanic and Atmospheric Administration. Archived from the original on 2008-10-27. Retrieved 2008-11-16. ↑ "A 14-year-long oil spill in the Gulf of Mexico verges on becoming one of the worst in U.S. history". Washington Post . Retrieved 2018-10-22. ↑ Welch, William M.; Joyner, Chris (May 25, 2010). "Memorial service honors 11 dead oil rig workers". USA Today. ↑ "Oil spill disrupts water supply – Nation – The Star Online" . Retrieved 20 April 2015. ↑ "Ecuador oil spill threatens Brazilian water supply". 2013-06-12. Retrieved 20 April 2015. ↑ "Kentucky Crude Oil Spill may reach river, contaminate drinking water" . Retrieved 20 April 2015. 1 2 Sarbatly R.; Kamin, Z. & Krishnaiah D. (2016). "A review of polymer nanofibres by electrospinning and their application in oil-water separation for cleaning up marine oil spills". Marine Pollution Bulletin. 106 (1–2): 8–16. doi:10.1016/j.marpolbul.2016.03.037. ↑ Bautista, H.; Rahman, K. M. M. (2016). "Effects of Crude Oil Pollution in the Tropical Rainforest Biodiversity of Ecuadorian Amazon Region". Journal of Biodiversity and Environmental Sciences. 8 (2): 249–254. ↑ Dunnet, G.; Crisp, D.; Conan, G.; Bourne, W. (1982). "Oil Pollution and Seabird Populations [and Discussion]". Philosophical Transactions of the Royal Society of London B. 297 (1087): 413–427. doi:10.1098/rstb.1982.0051. ↑ "Expert Recommends Killing Oil-Soaked Birds". Spiegel Online. May 6, 2010. Retrieved August 1, 2011. ↑ Wolfaardt, AC; Williams, AJ; Underhill, LG; Crawford, RJM; Whittington, PA (2009). "Review of the rescue, rehabilitation and restoration of oiled seabirds in South Africa, especially African penguins Spheniscus demersus and Cape gannets Morus capegnsis, 1983–2005". African Journal of Marine Science. 31 (1): 31–54. doi:10.2989/ajms.2009.31.1.3.774. ↑ Middlebrook, A. M.; Murphy, D. M.; Ahmadov, R.; Atlas, E. L.; Bahreini, R.; Blake, D. R.; Brioude, J.; de Gouw, J. A.; Fehsenfeld, F. C.; Frost, G. J.; Holloway, J. S.; Lack, D. A.; Langridge, J. M.; Lueb, R. A.; McKeen, S. A.; Meagher, J. F.; Meinardi, S.; Neuman, J. A.; Nowak, J. B.; Parrish, D. D.; Peischl, J.; Perring, A. E.; Pollack, I. B.; Roberts, J. M.; Ryerson, T. B.; Schwarz, J. P.; Spackman, J. R.; Warneke, C.; Ravishankara, A. R. (28 December 2011). "Air quality implications of the Deepwater Horizon oil spill". Proceedings of the National Academy of Sciences. 109 (50): 20280–20285. doi:10.1073/pnas.1110052108. PMC 3528553 . PMID 22205764. ↑ Tidwell, Lane G.; Allan, Sarah E.; O’Connell, Steven G.; Hobbie, Kevin A.; Smith, Brian W.; Anderson, Kim A. (6 January 2015). "Polycyclic Aromatic Hydrocarbon (PAH) and Oxygenated PAH (OPAH) Air–Water Exchange during the Deepwater Horizon Oil Spill". Environmental Science & Technology. 49 (1): 141–149. doi:10.1021/es503827y. PMC 4291772 . PMID 25412353. ↑ Li, R.; Palm, B. B.; Borbon, A.; Graus, M.; Warneke, C.; Ortega, A. M.; Day, D. A.; Brune, W. H.; Jimenez, J. L.; de Gouw, J. A. (5 November 2013). "Laboratory Studies on Secondary Organic Aerosol Formation from Crude Oil Vapors". Environmental Science & Technology. 47 (21): 12566–12574. doi:10.1021/es402265y. PMID 24088179. ↑ Ehrenhauser, Franz S.; Avij, Paria; Shu, Xin; Dugas, Victoria; Woodson, Isaiah; Liyana-Arachchi, Thilanga; Zhang, Zenghui; Hung, Francisco R.; Valsaraj, Kalliat T. (2014). "Bubble bursting as an aerosol generation mechanism during an oil spill in the deep-sea environment: laboratory experimental demonstration of the transport pathway". Environ. Sci. : Processes Impacts. 16 (1): 65–73. doi:10.1039/C3EM00390F. PMID 24296745. ↑ Nance, Earthea; King, Denae; Wright, Beverly; Bullard, Robert D. (13 November 2015). "Ambient air concentrations exceeded health-based standards for fine particulate matter and benzene during the Deepwater Horizon oil spill". Journal of the Air & Waste Management Association. 66 (2): 224–236. doi:10.1080/10962247.2015.1114044. PMID 26565439. 1 2 United States Coast Guard (2007). "Cumulative Spill Data and Graphics". United States Coast Guard. Archived from the original on 2008-10-08. Retrieved 2008-04-10. ↑ International Tanker Owners Pollution Federation (2008). "Oil Tanker Spill Information Pack". London: International Tanker Owners Pollution Federation. Retrieved 2008-10-08. 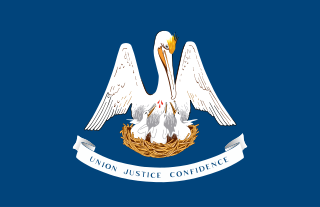 ↑ "The Environmental Literacy Council – Oil Spills". Enviroliteracy.org. 2008-06-25. Retrieved 2010-06-16. ↑ "Biological Agents – Emergency Management – US EPA". ↑ Kasai, Y; et al. (2002). "Predominant Growth of Alcanivorax Strains in Oil-contaminated and Nutrient-supplemented Sea Water". Environmental Microbiology. 4 (3): 141–47. doi:10.1046/j.1462-2920.2002.00275.x. ↑ "Oil and natural gas eating bacteria to clear-up spills". www.oilandgastechnology.net. April 30, 2014. 1 2 "Emergency Response: Responding to Oil Spills". Office of Response and Restoration. National Oceanic and Atmospheric Administration. 2007-06-20. ↑ Mullin, Joseph V; Champ, Michael A (2003-08-01). "Introduction/Overview to in Situ Burning of Oil Spills". Spill Science & Technology Bulletin. In-Situ Burning of Spilled Oil. 8 (4): 323–330. doi:10.1016/S1353-2561(03)00076-8. ↑ "Oil Spills". Library.thinkquest.org. Retrieved 2012-08-27. ↑ "Spill Response – Dispersants". International Tanker Operators Pollution Federation Limited. Retrieved 2010-05-03. ↑ "Spill Response – Dispersants Kill Fish Eggs". journal Environmental Toxicology and Chemistry. Retrieved 2010-05-21. ↑ Barry Carolyn (2007). "Slick Death: Oil-spill treatment kills coral". Science News. 172 (5): 67. doi:10.1002/scin.2007.5591720502. 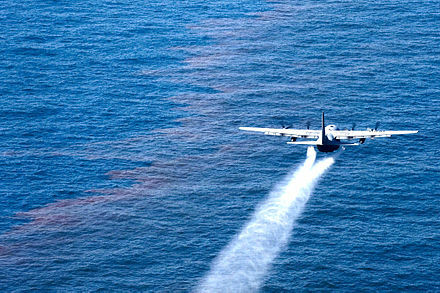 ↑ "Dispersant makes oil 52 times more toxic – Technology & science – Science – LiveScience – NBC News". msnbc.com. Retrieved 20 April 2015. ↑ Pezeshki, S. R.; Hester, M. W.; Lin, Q.; Nyman, J. A. (2000). "The effects of oil spill clean-up on dominant US Gulf coast marsh macrophytes: a review". Environmental Pollution. 108 (2): 129–139. doi:10.1016/s0269-7491(99)00244-4. ↑ "Quebec tragedy unlikely to slow oil shipments via rail". BostonGlobe.com. Retrieved 20 April 2015. ↑ "Oil Spill Response Procedure" (PDF). Chemstore UK. Retrieved 2014-02-25. ↑ "Environmental Sensitivity Index (ESI) Maps" . Retrieved 2010-05-27. 1 2 3 4 NOAA (2002). Environmental Sensitivity Index Guidelines, version 3.0. NOAA Technical Memorandum NOS OR&R 11. Seattle: Hazardous Response and Assessment Division, National Oceanic and Atmospheric Administration, 129p. ↑ Gundlach, E.R. and M.O. Hayes (1978). Vulnerability of Coastal Environments to Oil Spill Impacts. Marine Technology Society. 12 (4): 18–27. 1 2 NOAA (2008). Introduction to Environmental Sensitivity Index maps. NOAA Technical Manual. Seattle: Hazardous Response and Assessment Division, National Oceanic and Atmospheric Administration, 56p. 1 2 IMO/IPIECA (1994). Sensitivity Mapping for Oil Spill Response. International Maritime Organization/ International Petroleum Industry Environmental Conservation Association Report Series, Volume 1. 22p. ↑ Wang, Z.; Fingas, M.; Page, D.S. (1999). "Oil spill identification". Journal of Chromatography A. 843 (1–2): 369–411. doi:10.1016/S0021-9673(99)00120-X.